SpectraLogic has built the biggest, baddest mother of a tape library you can imagine, a 400,000 slot T-Finity monster with a 3.6 exabyte capacity. It's upgrading its T-Finity tape library with 8-node clustering and new BlueScale software to support exabyte capacity levels with RAID protection across tape cartridges. Spectra launched the dual-robot T-Finity in November 2009. It supported 30,000 slots and 45PB capacity in a single system, and more than 180PB in a 4-node unified system with 120,000 slots. Now we have more than 50,100 slots (LTO) spread across 40 frames in a single system, and up to 8 nodes in a cluster, meaning 400,000 cartridge slots. This is serious tape resourcing. Think about it: eight times 40 frames equals 320 racks, which is a whole lot of floor space in a raised floor data centre. But if you run a cloud service on or approaching Amazon, Azure, Facebook or Google scale, with hundreds of petabytes of online data and you're accumulating what's going to be exabytes of archive data, where are you going to put it? To echo the Ghostbusters movie: "Who you gonna call?" SpectraLogic is betting that you are going to call on a tape library and scalability is the key. So it has extended the T-Finity so that there can be up to 3.2TB of compressed data capacity with LTO-6 cartridges (1.3EB raw), 3.6EB with IBM TS1140 cartridges (1.2EB raw), and 1.2EB wit LTO-5 (601PB raw). Oracle boosted its StreamLine 8500 tape library by enabling 10 of them to link together to create a 100,000 slot vault. Tsk, tsk, not good enough Redwood Shores, that's only a quarter of the size of Spectra's humungous tape. 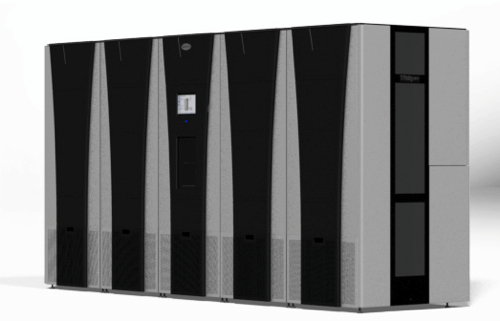 IBM's TS3500 library has a 2.7EB capacity for compressed data through linking 15 expansion units to a base frame. It uses the TS1140 drive and a 3:1 compression ratio to get to this capacity level, a drive which SpectraLogic supports in the T-Finity, and the format it uses to reach 3.6EB of compressed capacity. RAIT protects users from potential data loss similar to disk-based RAID capabilities. Users can recover from a media failure without having to make full duplicate copies of all the tapes in the library. Spectra has partnered with archive software developer HPSS to provide TeraPack-optimised RAIT. 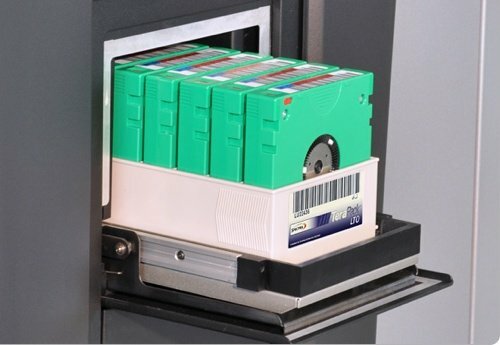 Tapes are loaded using TeraPack containers, each holding 10 tape cartridges with a unified barcode. There is a Bulk TeraPack access port and up to 15 TeraPack containers can be imported or exported in minutes. HPSS software provides "improved management, handling, import, export and storage, as well as up to 2x faster tape mounts of RAIT sets." TeraPack-optimised RAIT begins testing in customer environments later this month. Version 12 of the BlueScale library software provides faster barcode scanning than before, plus motion code enhancements providing 35 to 60 per cent faster robotic performance for T-Finity and also for Spectra's other enterprise and mid-range libraries. Spectra is also offering CarbideClean, a branded method of extending "the life of tape media and drives by using a precision carbide blade to pre-clean media prior to shipment to customers for initial use". It's offered on all Spectra-certified media at no charge. The company is offering a PriceLock service guarantee in the USA, saying that "list pricing of its T-Series tape library service contract rates will never increase above the rate of inflation. … Every Spectra Service and Support package is covered under the program." Similar plans are being developed for other regions. El Reg thinks that there is a dawning realisation that you cannot archive hundreds of petabytes of data or more in the cloud on disk. Major cloud service operators such as Google already realise this. It is our understanding that every major cloud service provider is working on tape initiatives. It's relatively straightforward for them to extrapolate their data generation trends and thus their need for archiving, and find out that cost/TB on disk-based systems, taking hardware, software, power and management costs into account, far exceeds that of tape. As soon as you get into exabyte-scale systems the cost gap widens even further and tape looks better and better. Enterprise data centres that can see their way to accumulating archival data in the 100PB-10EB range will surely come to the same conclusion, and either archive to the cloud, meaning indirect tape, or direct to their own tape systems.